"While everybody is taking life, I'm going to be saving it." 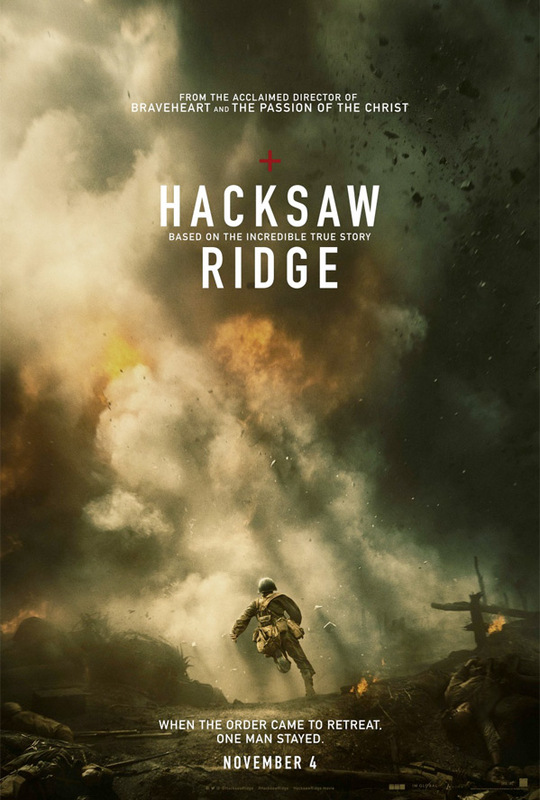 Lionsgate has debuted the first trailer for the latest film directed by Mel Gibson, a World War II drama called Hacksaw Ridge, about pacifist medic Desmond T. Doss played by Andrew Garfield. Doss was awarded the Medal of Honor by President Harry S. Truman for single-handedly saving the lives of over 75 of his comrades while under constant enemy fire during the brutal Battle of Okinawa. I'm a sucker for WWII films, and this is a helluva story. The ensemble cast includes Hugo Weaving, Vince Vaughn, Sam Worthington, Luke Bracey, Rachel Griffiths, Teresa Palmer, Matt Nable & others. This actually looks incredible, I'm very much looking forward to it. WWII American Army Medic Desmond T. Doss (Andrew Garfield), who served during the Battle of Okinawa, refuses to kill people and becomes the first Conscientious Objector in American history to be awarded the Medal of Honor. Based on the incredible true story. Hacksaw Ridge is directed by veteran actor-filmmaker Mel Gibson, who has previously directed the films The Man Without a Face, Braveheart, The Passion of the Christ, and Apocalypto. The screenplay is written by Andrew Knight, Robert Schenkkan and Randall Wallace. Lionsgate will release Mel Gibson's Hacksaw Ridge in theaters everywhere starting November 4th later this fall. Read more about Desmond T. Doss on Wikipedia. Interested in seeing this? Is this really based on a true story? What's the logic behind going to a battlefield without a gun? I mean... like yeah... what is it good for? War might not make sense but it has been the natural state of humanity for about a million and a half years, as has chattel slavery. It was only the morality found in Christianity that ended up helping people rise above human nature to finally stop chattel slavery, and that morality is also the basis for our current view that war is wrong. The rest of the population of the earth doesn't think the same way, which is why the West has been in a civilizational war against Islam for the last 1400 years. Our politicians pretend that we've not been, but we have. We can pretend that war is an outdated concept and try to ignore it, but only for so long. "You might not be interested in war, but war is interested in you." I'm a very educated Christian, who is also very educated in history, science, philosophy, sociology, and pretty much every other subject you can name. I think you naturally assume that Christians aren't well educated. Nothing could be further from the truth. You're right that this isn't the place for such a discussion. The points I made in my first post still stand as true. Have a good one. Well, let's not mix things and make wrong conclusions: I have very well educated Christian friends which will hopefully stay that until the end of my days. But it is another thing and not educated one to say that Christianity has changed the world for better. Partly but not overwhelmingly. And it also changed it for worse. In many shameful aspects too. Christianity was and is just one force of the the history. In many respects questionable and in many things commendable but never one of those thing and definitely not unique when it comes to positive changes in history. So, saying something critical about Christianity does not mean to say that being a Christian means necessarily being non-educated person. Of course, saying that something stands as a truth simply because somebody says so does look like it's coming from Christian person. And that is not really the best example of educated person. But we can't have everything these days, can we? People who hate apocalypto deserve to be hugged by a facehugger. ;D Apocalypto is a great movie. Didn't know that got any hate. I only heard great things about it before I saw it. Fantastic film! Pretty much all of Mel's movies are great, including that stupid one where he wore the hand puppet. This one will be a classic, I am sure. THE BEAVER was directed by Jodie Foster. Which is a shame, because Jodie is a good filmmaker. The beaver was a big stinker. It was pretty good for what it was. Not all film are "terrible" or "excellent." Well, I found the script heavy. I couldn't buy Mel performance. All this puppet thing sounded out of place and weirdo. Not something you could see happening in real life. Maybe if Dustin Hoffman was the beaver man I would have believed his performance. This, uh, has best picture written all over it. A lot of Aussies in this one. It looks good, but Southern accents are hokey. What did he accomplish? He killed 20 men by cutting their throats with his teeth? Guy had more guts than most. Though I'm more looking forwards to the SAS 6 days film. 0/10 troll job. Did Bo change names? This is the Medal of Honor citation for Desmond Doss: He was a company aid man when the 1st Battalion assaulted a jagged escarpment 400 feet [120 m] high. As our troops gained the summit, a heavy concentration of artillery, mortar and machinegun fire crashed into them, inflicting approximately 75 casualties and driving the others back. Pfc. Doss refused to seek cover and remained in the fire-swept area with the many stricken, carrying all 75 casualties one-by-one to the edge of the escarpment and there lowering them on a rope-supported litter down the face of a cliff to friendly hands. On May 2, he exposed himself to heavy rifle and mortar fire in rescuing a wounded man 200 yards [180 m] forward of the lines on the same escarpment; and 2 days later he treated 4 men who had been cut down while assaulting a strongly defended cave, advancing through a shower of grenades to within 8 yards [7.3 m] of enemy forces in a cave's mouth, where he dressed his comrades' wounds before making 4 separate trips under fire to evacuate them to safety. On May 5, he unhesitatingly braved enemy shelling and small arms fire to assist an artillery officer. He applied bandages, moved his patient to a spot that offered protection from small arms fire and, while artillery and mortar shells fell close by, painstakingly administered plasma. Later that day, when an American was severely wounded by fire from a cave, Pfc. Doss crawled to him where he had fallen 25 feet [7.6 m] from the enemy position, rendered aid, and carried him 100 yards [91 m] to safety while continually exposed to enemy fire. On May 21, in a night attack on high ground near Shuri, he remained in exposed territory while the rest of his company took cover, fearlessly risking the chance that he would be mistaken for an infiltrating Japanese and giving aid to the injured until he was himself seriously wounded in the legs by the explosion of a grenade. Rather than call another aid man from cover, he cared for his own injuries and waited 5 hours before litter bearers reached him and started carrying him to cover. The trio was caught in an enemy tank attack and Pfc. Doss, seeing a more critically wounded man nearby, crawled off the litter; and directed the bearers to give their first attention to the other man. Awaiting the litter bearers' return, he was again struck, by a sniper bullet while being carried off the field by a comrade, this time suffering a compound fracture of 1 arm. With magnificent fortitude he bound a rifle stock to his shattered arm as a splint and then crawled 300 yards [270 m] over rough terrain to the aid station. Through his outstanding bravery and unflinching determination in the face of desperately dangerous conditions Pfc. Doss saved the lives of many soldiers. His name became a symbol throughout the 77th Infantry Division for outstanding gallantry far above and beyond the call of duty. Wow. This guy was either crazy or a saint. Maybe both. That was good to read, thanks for posting. Reading all that - sounds like if ever there was a human protected by a Higher Power, Pfc Doss would be on the short list. Come on Mel, when are you going to fall off the wagon and get real again. You're so boring sober. Don't keep us waiting, go ahead and have that drink. Cheers! Gibbers does realistic and horrific violence incredibly well. I always wonder how anyone survived the destruction of WW2. To me it looked like hell on earth. Will no doubt get round to watching this. agreed. I've read many books on the eastern front - and what went on there was hard to read about - I can't imagine being there. This trailer makes my eyes rain! wow. THAT was an emotional trailer - a "must see" for me. I have a lot of respect for Mel's filmmaking skills. He has definitely had his personal dramas but dang he can make a good movie. Far out that gave me chills and reading more about what this guy did gets me pumped to watch it. I am already about to cry from just the trailer!